Demography is the study of population dynamics, using statistical and mathematical tools. Demographic studies help scientists understand the population dynamics of species, such as invasive species like the Asian carp. Population fluctuations depend on the weather, food availability, natural disasters such as forest fires or volcanic eruptions, predation, and biological competition. Researchers originally designed demographic tools to study human populations, but demographic approaches can be applied to all living populations. statistics: a systematic collection of data on measurements or observations, often related to demographic information such as population counts, incomes, population counts at different ages, etc. Imagine someone sailing down a river in a small motorboat on a warm day. She is enjoying the warm sunshine and cool breeze when suddenly a 20-pound silver carp hits her in the head. The presence of Asian carp in U.S. waterways make this risk very real on rivers and canal systems, particularly in Illinois and Missouri. Asian carp jump out of the water in response to electrofishing: The Asian carp in the inset photograph were harvested from the Little Calumet River in Illinois in May, 2010, using rotenone, also used as an insecticide. The several types of Asian carp include the silver, black, grass, and big head carp. These have been farmed and eaten in China for over 1,000 years; it is among the top aquaculture foods worldwide. In the United States, however, Asian carp is considered to be an invasive species. It disrupts the structure and composition of native fish communities to the point of threatening native aquatic species. Biologists are working to understand the biology and ecology of Asian carp. The aim is to develop methods of controlling the species without damaging native fish. Understanding the population dynamics of the carp will help biologists develop and implement measures that reduce its population, allowing scientists to model the statistics of carp populations. Populations are dynamic entities, consisting of all of the species living within a specific area. They fluctuate based on a number of factors: seasonal and yearly changes in the environment, natural disasters such as forest fires and volcanic eruptions, and competition for resources between and within species. Demography, the statistical study of population dynamics, uses mathematical tools to investigate how populations respond to changes in their biotic and abiotic environments. Researchers originally designed demographic tools, such as life tables, to study human populations. To determine insurance rates, life insurance companies developed methods to analyze life expectancies of individuals in a population. The term “demographics” is often used in discussions of human populations, but demographic approaches can be applied to all living populations. Scientists study population size and density using a variety of field sampling methods, including quadrats and mark-recapture. A population ‘s size refers to the number of individuals (N) it comprises. Population density is the number of individuals within a given area or volume. Scientists usually study populations by sampling, which involves counting individuals within a certain area or volume that is part of the population’s habitat. The quadrat method is used to sample sessile organisms, using a square within which all individuals are counted; extrapolation of the data to the entire habitat results in a population size estimate. The mark and recapture technique is used for mobile organisms; it involves marking a sample of individuals and then estimating population size from the number of marked individuals in subsequent samples. Population size and density are the two most important statistics scientists use to describe and understand populations. A population’s size refers to the number of individuals (N) it comprises. Its density is the number of individuals within a given area or volume. These data allow scientists to model the fluctuations of a population over time. For example, a larger population may be more stable than a smaller population. With less genetic variation, a smaller population will have reduced capacity to adapt to environmental changes. Individuals in a low-density population are thinly dispersed; hence, they may have more difficulty finding a mate compared to individuals in a higher-density population. On the other hand, high-density populations often result in increased competition for food. Many factors influence density, but, as a rule-of-thumb, smaller organisms have higher population densities than do larger organisms. Population density is negatively correlated with body size: Australian mammals show a typical inverse relationship between population density and body size. Counting all individuals in a population is the most accurate way to determine its size. However, this approach is not usually feasible, especially for large populations or extensive habitats. Instead, scientists study populations by sampling, which involves counting individuals within a certain area or volume that is part of the population’s habitat. Analyses of sample data enable scientists to infer population size and population density about the entire population. A variety of methods can be used to sample populations. Scientists usually estimate the populations of sessile or slow-moving organisms with the quadrat method. A quadrat is a square that encloses an area within a habitat. The area may be defined by staking it out with sticks and string, or using a square made of wood, plastic, or metal placed on the ground. 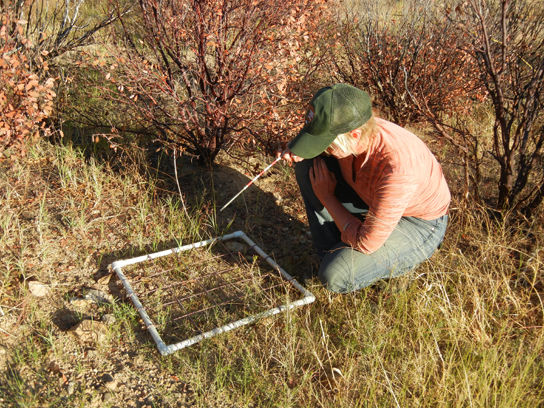 Scientist uses a quadrat to measure plant population size and density: A quadrat is a square frame of known area in which species of interest can be easily counted and measured. A field study usually includes several quadrat samples at random locations or along a transect in representative habitat. After they place the quadrats, researchers count the number of individuals that lie within the quadrat boundaries. The researcher decides the quadrat size and number of samples from the type of organism, its spatial distribution, and other factors. For sampling daffodils, a 1 m2 quadrat could be appropriate. Giant redwoods are larger and live further apart from each other, so a larger quadrat, such as 100 m2, would be necessary. The correct quadrat size ensures counts of enough individuals to get a sample representative of the entire habitat. Scientists typically use the mark and recapture technique for mobile organisms such as mammals, birds, or fish. With this method, researchers capture animals and mark them with tags, bands, paint, body markings, or some other sign. The marked animals are then released back into their environment where they mix with the rest of the population. Later, a new sample is collected, including some individuals that are marked (recaptures) and some individuals that are unmarked. Mark and recapture is used to measure the population size of mobile animals. : With the mark and recapture method, researchers capture animals and mark them with tags, bands, paint, body markings or some other sign. Plugging the example data into the equation, the calculation gives an estimated total population size of 400. Using the example data, if only 10 already-marked deer had been recaptured, the calculated total population size would be 800. The mark and recapture method has limitations. Some animals from the first catch may learn to avoid capture in the second round. Such behavior would cause inflated population estimates. Alternatively, animals may preferentially be retrapped (especially if a food reward is offered), resulting in an underestimate of population size. Also, some species may be harmed by the marking technique, reducing their survival. A variety of other techniques have been developed, including the electronic tracking of animals tagged with radio transmitters and the use of data from commercial fishing and trapping operations to estimate the size and health of populations and communities. Scientists gain insight into a species’ biology and ecology from studying spatial distribution of individuals. Dispersion or distribution patterns show the spatial relationship between members of a population within a habitat. Individuals of a population can be distributed in one of three basic patterns: uniform, random, or clumped. In a uniform distribution, individuals are equally spaced apart, as seen in negative allelopathy where chemicals kill off plants surrounding sages. In a random distribution, individuals are spaced at unpredictable distances from each other, as seen among plants that have wind-dispersed seeds. In a clumped distribution, individuals are grouped together, as seen among elephants at a watering hole. Density and size are useful measures for characterizing populations. Scientists gain additional insight into a species’ biology and ecology from studying how individuals are spatially distributed. Dispersion or distribution patterns show the spatial relationship between members of a population within a habitat. Patterns are often characteristic of a particular species; they depend on local environmental conditions and the species’ growth characteristics (as for plants) or behavior (as for animals). 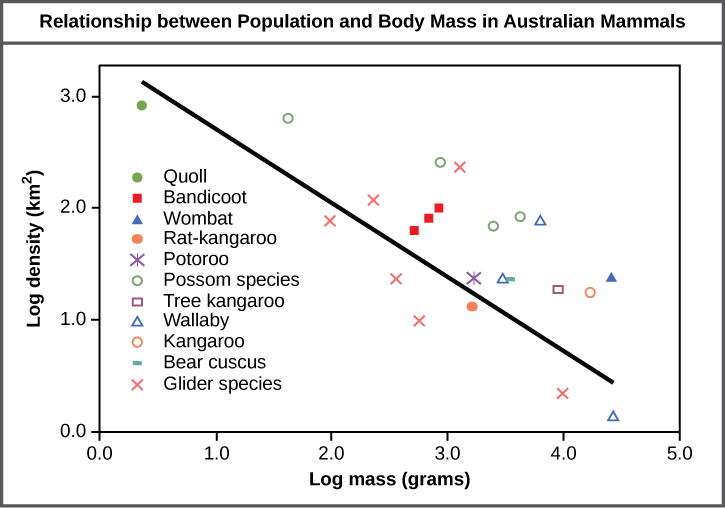 Individuals of a population can be distributed in one of three basic patterns: they can be more or less equally spaced apart (uniform dispersion), dispersed randomly with no predictable pattern (random dispersion), or clustered in groups (clumped dispersion). Three patterns of distribution in populations of organisms: A population may have a uniform, random, or clumped distribution. Territorial birds, such as penguins, tend to have uniform distribution. Plants with wind-dispersed seeds, such as dandelions, are usually distributed randomly. Animals, such as elephants, that travel in groups exhibit clumped distribution. Uniform dispersion is observed in plant species that inhibit the growth of nearby individuals. For example, the sage plant, Salvia leucophylla, secretes toxins, a phenomenon called negative allelopathy. The chemicals kill off surrounding plants in a circle around the individual sage plants, leading to a uniform distance between each plant. Animals that maintain defined territories, such as nesting penguins, also exhibit uniform dispersion. Random dispersion occurs with dandelion and other plants that have wind-dispersed seeds that germinate wherever they happen to fall in a favorable environment. Clumped dispersion is seen in plants that drop their seeds straight to the ground, such as oak trees, or animals that live in groups, such as schools of fish or herds of elephants. Clumped dispersions may also result from habitat heterogeneity. If favorable conditions are localized, organisms will tend to clump around those, such as lions around a watering hole. In this way, the dispersion pattern of the individuals within a population provides more information about how they interact with each other and their environment than does a simple density measurement. 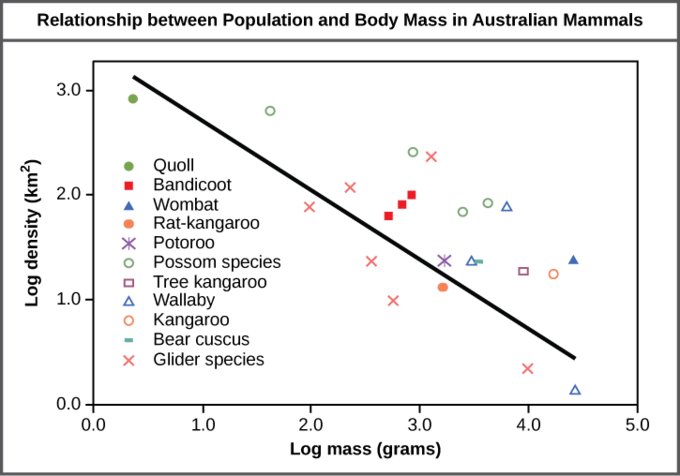 Just as lower density species might have more difficulty finding a mate, solitary species with a random distribution might have a similar difficulty when compared to social species clumped together in groups. Demography, or the study of population dynamics, is studied using tools such as life tables and survivorship curves. The key statistics used in demography are birth rates, death rates, and life expectancies which may be influenced by population characteristics and biological factors. Birth rates, death rates, and life expectancies are the basic determinants of how a population changes over time. Life tables are demographic tools which shows a population’s life expectancy and mortality within age groups. A survivorship curve is a graph of the number of individuals surviving at each age interval plotted versus time. The characteristics and behavior of a species, such as number of offspring produced, its percentage of surviving offspring, and degree of parental care, determine the shape of its survivorship curve. Population size, density, and distribution patterns describe a population at a fixed point in time. To study how a population changes over time, scientists must use the tools of demography: the statistical study of population changes over time. The key statistics demographers use are birth rates, death rates, and life expectancies; although, in practice, scientists also study immigration and emigration rates, which also affect populations. These measures, especially birth rates, may be related to the population characteristics described in prior sections. For example, a large population would have a relatively-high birth rate if it has more reproductive individuals. Alternatively, a large population may also have a high death rate because of competition, disease, or waste accumulation. A high population density may lead to more reproductive encounters between individuals, as would a clumped distribution pattern. Such conditions would increase the birth rate. Biological features of the population also affect population changes over time. Birth rates will be higher in a population with the ratio of males to females biased towards females, or in a population composed of relatively more individuals of reproductive age. The demographic characteristics of a population are the basic determinants of how the population changes over time. If birth and death rates are equal, the population remains stable. The population will increase if birth rates exceed death rates, but will decrease if birth rates are lower than death rates. Life expectancy, another important factor, is the length of time individuals remain in the population. It is impacted by local resources, reproduction, and the overall health of the population. These demographic characteristics are often displayed in the form of a life table. The life table shown is from a study of Dall mountain sheep, a species native to northwestern North America. The population is divided into age intervals, as seen in the leftmost column. The mortality rate per 1,000 individuals is calculated by dividing the number of individuals dying during an age interval by the number of individuals surviving at the beginning of the interval, multiplied by 1,000. 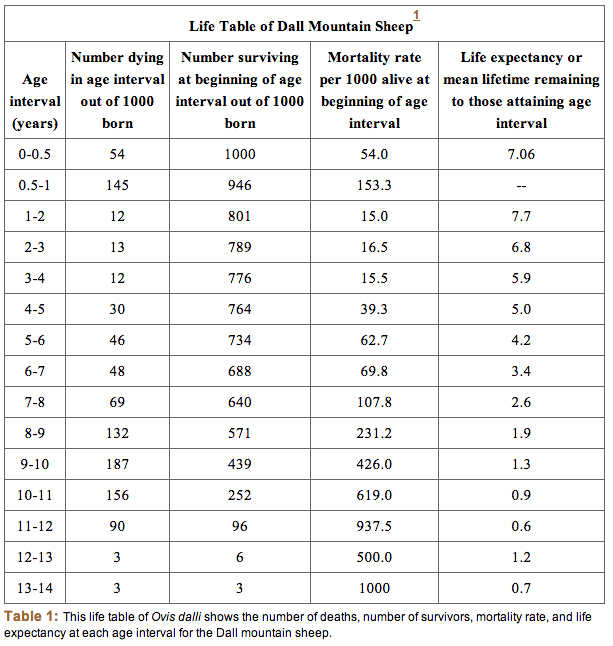 Life table of Dall mountain sheep: This life table of Ovis dalli shows the number of deaths, number of survivors, mortality rate, and life expectancy at each age interval for the Dall mountain sheep. For example, between ages three and four, 12 individuals die out of the 776 that were remaining from the original 1,000 sheep. This number is then multiplied by 1,000 to get the mortality rate per thousand. As can be seen from the mortality rate data (column D), a high death rate occurred when the sheep were between 6 and 12 months old, which then increased even more from 8 to 12 years old, after which there were few survivors. The data indicate that if a sheep in this population were to survive to age one, it could be expected to live another 7.7 years on average, as shown by the life expectancy numbers in column E.
Another tool used by population ecologists is a survivorship curve, which is a graph of the number of individuals surviving at each age interval plotted versus time (usually with data compiled from a life table). These curves allow comparison of life histories of different populations. Survivorship curves show the distribution of individuals in a population according to age: Humans and most mammals have a Type I survivorship curve because death primarily occurs in the older years. Birds have a Type II survivorship curve, as death at any age is equally probable. Trees have a Type III survivorship curve because very few survive the younger years, but after a certain age, individuals are much more likely to survive. Humans and most primates exhibit a Type I survivorship curve because a high percentage of offspring survive early and middle years; death occurs predominantly in older individuals. These species have few offspring as they invest in parental care to increase survival. 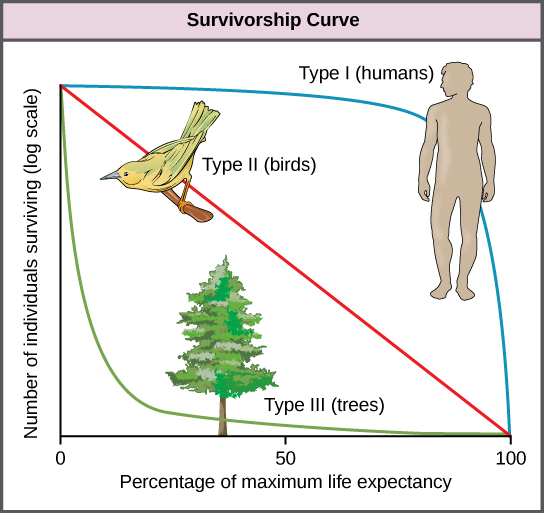 Birds show the Type II survivorship curve because equal numbers of birds tend to die at each age interval. These species may also have relatively-few offspring and provide significant parental care. Trees, marine invertebrates, and most fishes exhibit a Type III survivorship curve. Very few individuals survive the younger years; however, those that live to old age are likely to survive for a relatively-long period. Organisms in this category usually have large numbers of offspring and provide little parental care. Such offspring are “on their own” and suffer high mortality due to predation or starvation; however, their abundance ensures that enough individuals survive to the next generation, perpetuating the population.